Our gift certificates make a great gift! They are e-gift certificates that you can use either for yourself, or email them to your friends via the links provided on your account. You can email as much as you want, to various people, up to the amount you have purchased. Whoever you email your gift to will receive a redemption code that they can use to credit their gift voucher account and make purchases with. $100 e-Gift Certificate - Makes a great gift! Gift certificates can be sent to anyone via email, where the recipient can spend it any way she wishes here at Orange Crush Beads. $25 e-Gift Certificate - Makes a great gift! 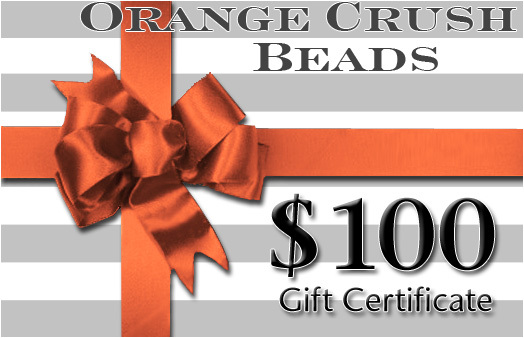 Gift certificates can be sent to anyone via email, where the recipient can spend it any way she wishes here at Orange Crush Beads. $50 e-Gift Certificate - Makes a great gift! Gift certificates can be sent to anyone via email, where the recipient can spend it any way she wishes here at Orange Crush Beads.